This article is about the characters. You may be looking for the commands named after Doc, Grumpy, Happy, Sleepy, Bashful, Sneezy, and Dopey. One of seven dwarfs who live with Snow White in a cottage deep in the woods. Doc is the most knowledgeable; he's the one with the glasses. One of seven dwarfs who live with Snow White in a cottage deep in the woods. At first, Grumpy had nothing pleasant to say about her, but her kindness warmed his heart over time. Grumpy is suspicious of everything and slow to trust anyone, and always wears a look of displeasure. One of seven dwarfs who live with Snow White in a cottage deep in the woods. Happy's constant smiles are a comfort to all around him. One of seven dwarfs who live with Snow White in a cottage deep in the woods. Sleepy always looks ready to doze off. One of seven dwarfs who live with Snow White in a cottage deep in the woods. Bashful will turn red if you so much as say hello. One of seven dwarfs who live with Snow White in a cottage deep in the woods. Sneezy... Well, he sneezes a lot. One of seven dwarfs who live with Snow White in a cottage deep in the woods. Dopey is always one clumsy step behind the other dwarfs, and meets with many a mishap. Dopey loves Snow White so much, he'll dart to the front of the line just to see her. Seven dwarfs who live in a cottage deep in the woods. 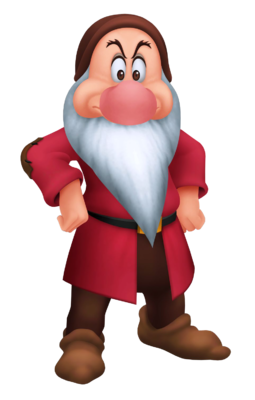 The Seven Dwarfs are characters introduced in Kingdom Hearts Birth by Sleep. Their names are Doc, Grumpy, Happy, Sleepy, Bashful, Sneezy, and Dopey. They appear along with Snow White in their homeworld, Dwarf Woodlands. The dwarfs in the cottage. The Seven Dwarfs appear in their homeworld of Dwarf Woodlands, living a peaceful life in their cottage in a clearing within the forest. While working in the nearby mines, they encounter Ventus and mistake him for a jewel thief. All of the Dwarfs except Dopey try to drive him out, but Ventus gets the better of them and manages to obtain information on where to look for his friend Terra, though they are still hesitant to trust him. The dwarfs later return to their cottage to find Snow White there, learning how she met Terra and was attacked by Unversed. The Dwarfs conclude that Terra was controlling the monsters, but Ventus insists Terra wouldn't do such a thing. Later, Snow White falls into a deep slumber after taking a bite from the Queen's poison apple, and the Dwarfs place her in a glass coffin to mourn her. However, thanks to assistance from Aqua and the Prince, Snow White is able to awaken, and the Dwarfs celebrate as she departs with the Prince. Some time after the battle at the Keyblade Graveyard, the Seven Dwarfs gather around Snow White and the Prince in the clearing and throw beautiful flower petals over them, as though to make a beautiful scene for the lovers. The Dwarfs only appear with Snow White on one of the Stations in the Dive to the Heart. Unlike the Beast's servants, they are depicted as awake, meaning that they were possibly able to escape their world's destruction. Doc (先生, Sensei? ): The leader of the group. He tends to stumble up his words. Grumpy (おこりんぼ, Okorinbo? ): Always angry and the dissenting voice of the group. Happy (ごきげん, Gokigen? ): Joyful and always seen with a smile. Sleepy (ねぼすけ, Nebosuke? ): Usually dozing off. Bashful (てれすけ, Teresuke? ): Extremely shy and blushes often. Sneezy (くしゃみ, Kushami? ): Has hay-fever and makes windy sneezes at the worst times. Dopey (おとぼけ, Otoboke? ): Fun loving, clumsy, mute and rather childish. The Seven Dwarfs are all roughly the same short height (about half the height of Aqua) and they all wear tuque-like hats, jackets with patches on the elbows (except for Doc, who rolls his sleeves up, obscuring the elbows, and Happy, who wears a vest and undershirt with patched elbows), and brown, sock-like shoes. Except for Dopey, they all have beards and eyes that are a shade of brown or amber. The tops of all their heads are completely bald. Doc is a bit overweight and sports a thick, but short, white beard. His hat is yellow and stands on end for an unknown reason, a trait shared in both Bashful and Happy's hats. 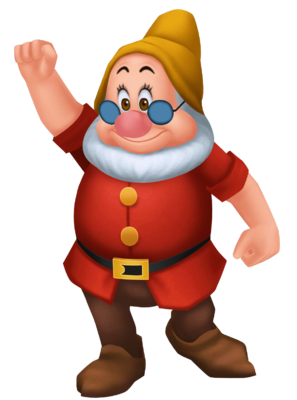 He has a large, round, pink nose and is the only Dwarf to wear glasses. He wears a red jacket with two gold buttons going down the front, brown pants, and a black belt with a gold buckle around his waist. Doc rolls the sleeves of his jacket up. 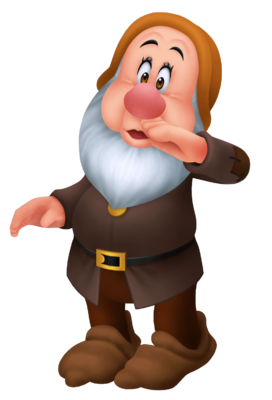 Grumpy is rather thin in comparison to some of the other Dwarfs, and has the largest, most bulbous pink nose out of all the Dwarfs. His thick, white beard reaches to just past his waist. His tuque is brown and the tip flops down. His jacket is carmine colored and secured by a black belt with a gold buckle. The patches are brown, as are his pants. 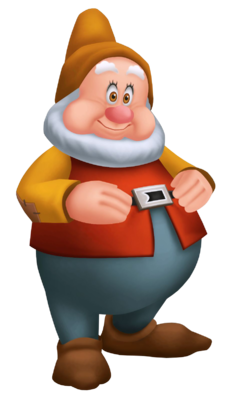 Happy is the fattest Dwarf and seemingly the oldest, as he has thick, white eyebrows in addition to his white beard, as opposed to all the other Dwarfs having black eyebrows. His beard is identical to Doc's. Happy's tuque is orange and stands on end and his round, pink nose is the second smallest out of the Dwarfs. His pants are steel blue, and he wears a red vest overtop a yellow, long-sleeved shirt with tan patches. Happy wears a black belt with a silver buckle. Sleepy wears a light steel blue tuque that flops down and is a bit longer than those worn by the other Dwarfs. His round, pink nose is roughly the same size as Doc's and his thick, white beard seems to be the longest out of all the Dwarfs (though Bashful's beard may be the same length). He wears brown pants and a tan jacket with brown patches. His belt is black, but the buckle is obscured by his beard. Sleepy's eyes are usually half-closed. Bashful wears a steel blue tuque that stands on end and has a thick, white beard that reaches to about knee-length, roughly the same length as Sleepy's beard. He appears to have the second largest nose out of the Dwarfs and wears a yellow-orange jacket with tan patches. Like Sleepy, Bashful wears a black belt, but the buckle is covered by his beard. His pants are an orange-brown color. 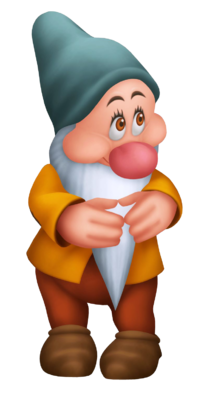 Sneezy has a thick, white beard that reaches to about chest-length and wears an orange tuque that droops in the same manner as Grumpy's. His round, bulbous nose is just slightly smaller than Bashful's. His jacket is dark brown with brown patches and sports at least one gold button. His belt is black and the buckle is gold, while his pants are brown. 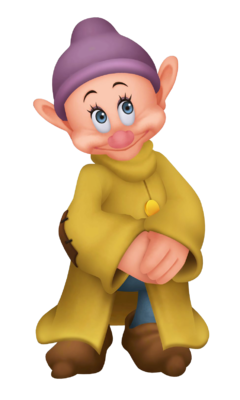 Dopey seems to be the youngest Dwarf, as he is the only Dwarf without a beard, and wears a purple hat along with a light green jacket with two gold buttons down the front. His hat and jacket seem to be a bit too large for him, and his jacket partially covers his black, gold-buckled belt. The patches on his elbows are brown. His pants are steel blue and his nose is the smallest of the Dwarfs. 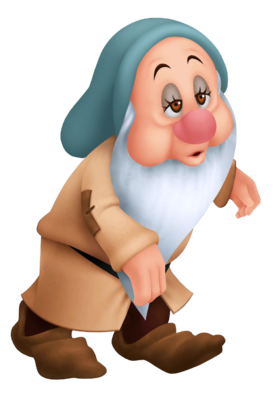 Dopey's eyes are blue and he has large ears; in fact, he is the only Dwarf whose ears are visible. Dopey is completely bald underneath his hat. The Seven Dwarfs come from the European classic fairy tale Snow White and appeared in Disney's animated film Snow White and the Seven Dwarfs. When Snow White runs away from the Evil Queen at the huntsman's admonition, she later finds a cottage in the woods, thinking it to be owned by seven children. As she sleeps inside, the Dwarfs return home after a day of diamond mining, only to find something in their bedroom. The Dwarfs think she is a monster until she wakes up to reveal a princess. At that point on, the Dwarfs accept Snow White as a mother figure as she cooks soup, does chores, and shows the utmost affection that even reverses Grumpy's ways. When the Evil Queen visits the cottage with the poison apple, disguised as an old woman, the Dwarfs are away at work. After Snow White falls under the curse of the poison apple, the forest animals alert the Dwarfs, taking them to the Evil Queen. As the Evil Queen is pursued, she attempts to crush the Dwarfs with a rock, only to be crushed by one herself. The Dwarfs return to their cottage, mourning the princess's death until the Prince comes and revives her, leaving the Dwarfs in a happy ending. This page was last edited on 6 September 2018, at 22:23.